So, this is what happened yesterday. I had to undergo a KT session with a team mate of mine. She said she would take the session after giving her certification which was scheduled for after lunch. And that certification was what became our topic of conversation for a good ten mins because I just gave the same certification a week ago. Cut to the scene after her certification, when I bumped into her in the washroom. Me: “Okay. I will join you in a bit”, I said washing my hands. She was looking pointedly at me and I gave her a quizzical look. Oh! So that was it. She wanted me to ask how her certification had been. And we spent another 2-5 mins discussing the key points of the certification till she was assured that her strategy for the re-test had to be what we had discussed. The key thing that I realized yet again was something else. I am absolutely inept at making small talk. I knew she had finished her certification but asking her about it seemed like a personal question so I didn’t. And there she was, wanting to tell me all about it. For her it was just a way to get conversational as it must be with a million other people. But I happen to be an absolute failure in this matter. Most people always start the conversation on a Monday morning by enquiring about all the Hows, Wheres and Whats of the weekend spent. I generally don’t till I am asked. I can’t even get myself to ask people about the weather in a different city on the phone. I realized that this was also a way to make conversation when a friend called over for no apparent reason and asked me this before we went chattering along the memory lane. There is this cubicle-mate of mine who bought a Sari for his mom at a sale that was held in the office. I was snoozing at my desk and he actually woke me up to get my opinion about it so that he could get it changed while he still had the opportunity to, if necessary. I gave him my two cents on it and that was the end of conversation for me. I didn’t even bother asking the price or whether the collection at the sale was good or anything else like the other guy in the cube did. Reason? It didn’t occur to me that I should have asked. And I was very ashamed of myself that being a girl, I could not take even that much interest in a matter that a guy thought was addressed best by a girl. There is this particular friend of mine who makes it a point to ask me every single day the same question when we get down from the bus, “Did you have your breakfast?” I have still not learnt to be the first one to ask her the question. There are so many such small gestures by different people that make me feel warm at heart. Even if it is just polite small talk, it gives the impression that the person cares a little bit for you. I on the other hand am totally incapable of making a person feel comfortable in my presence by making idle conversation. Though I am known to be more like a chattering magpie and an outgoing extrovert I can’t seem to get the hang of unnecessary polite conversations. 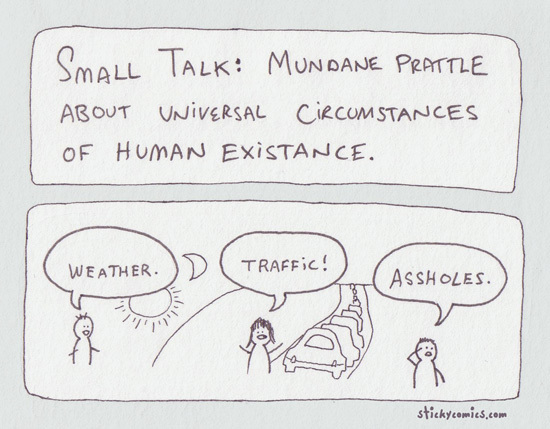 I prefer silence to that, probably more out of fear of having to make small talk in return more than anything else.